If you've been streaming the position and need a waiver wire QB to get you past the first round of the fantasy playoffs, look no further than Josh Allen who has been great as of late. Over the past two games, he's rushed over 99 yards in both games and finished with 26.3 and 28.7 fantasy points. This week he's against the New York Jets who have allowed at least 232 yards passing and 2 touchdowns over their past three games. If Allen is able to continue rushing the ball for 90+ yards a game, he'll finish as a top-10 QB this week. Jaylen Samuels is by far the most valuable waiver wire pickup this week and should be productive for owners right away. James and DeAngelo Williams are proof that whoever the lead back is in the Pittsburgh offense, they will receive volume and they score fantasy points. This week the Steelers play the Raiders who have given up at least 113 yards rushing to 9 of 12 teams' running backs. The Steelers are fighting for home field advantage come playoff time and will need to keep their foot on the gas come Sunday. If you are able to slot him into TE due to your platform's eligibility rules, play Samuels at TE if you don't roster Travis Kelce or Zach Ertz. With teammate DeSean Jackson likely out again this week with an injury, Chris Godwin has a chance to blow up against a very weak New Orleans Saints secondary. The Saints defense is allowing the highest amount of fantasy points to opposing team's' wide receivers (46.6) and while they haven't given up two touchdowns to wide receivers since Week 9, the Buccaneers did have their way with them in Week 1. New Orleans is significantly better than they were to open the season, which means they'll be firing on all cylinders early and often, hoping to avenge their loss last week against the Cowboys. The Buccaneers will be in catch up mode for most of the game and Godwin should easily surpass double-digit fantasy points this week. Just when owners thought they could trust David Njoku he posts 3-8-0 last week against the Texans. 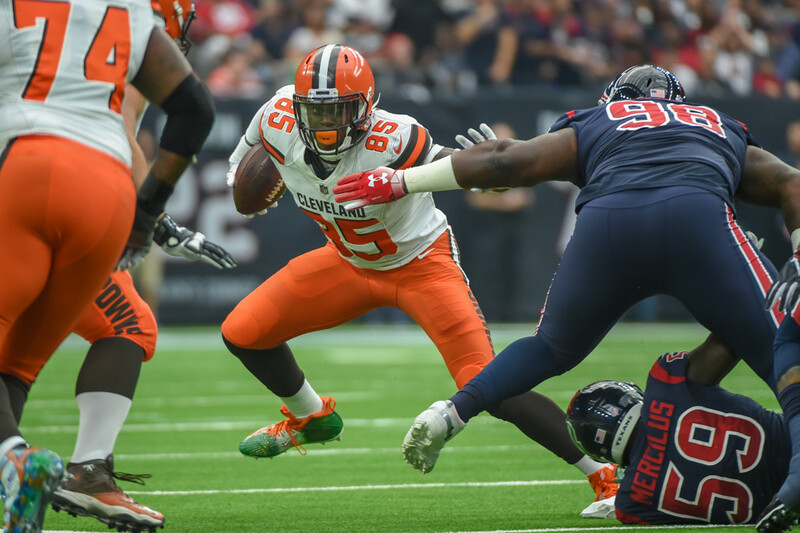 This week Njoku should bounce back in a big way as the Browns host the Panthers who are giving up the third most fantasy points (16.7) on average to the position. With Baker Mayfield playing lights out as of late, it's only a matter of time until he and Njoku link up once against for a monster week, and I believe it's this week against the Panthers. Mason Crosby hasn't scored double-digit fantasy points since Week 8 but has a lot of upside this week. The Packers square off against the Falcons who have given up an average of 12 fantasy points to opposing team's kickers over the past three weeks. Not only that, but the Packers have an implied team total of 26.75 which is the 6th highest of the week. Both defenses are fairly weak and a lot of points will be scored in this matchup, giving an ample amount of opportunity to cross the double-digit fantasy point total this week. This week the Detroit Lions are at home against the Arizona Cardinals who have an implied team total of only 19.0 which is the 5th-lowest this week. Their offense just lost Christian Kirk for the season and the Cardinals are giving up the second-most fantasy points on average (11.1) to opposing defenses. The Lions should generate a ton of pressure with the upside for multiple turnovers given Josh Rosen's inexperience. Russell Wilson's fantasy production over the past few weeks has been fantastic - over the past 8 weeks his lowest fantasy score is 18.6 and he's managed to throw for at least 2 touchdowns in all but one game this season. Wilson has been consistent, but his throwing volume is concerning- just last week he only had 17 pass attempts, 11 of which were completed. Of those 11, 4 were touchdowns, something that is surely not repeatable week after week. The Seahawks are by far a run-first team and New England running backs are coming off a week where they scored a combined 47.3 fantasy points. Wilson most likely won't have 25+ attempts in this one and banking on him to throw 3+ touchdowns may be a mistake come Sunday. Is Spencer Ware a must play this week? He rushed for a pedestrian 47 yards on 14 carries and had one catch for 5 yards - his saving grace on the day was a short-yardage touchdown, but I wouldn't expect his rushing totals to increase this week given a tough matchup against the Baltimore Ravens. Ware faces a defense that is allowing the least amount of fantasy points to running backs per week (17.0) and has allowed an average of only 36.3 yards per game over the past three matchups. With the signing of Charcandrick West, who will undoubtedly cut into Ware's third-down playing time, the overall upside is limited this week. Over the past four weeks, Corey Davis has produced for fantasy owners, averaging 17.1 fantasy points, including scoring touchdowns in 3 out of 4 games. This week will prove to be much tougher as he'll be opposite Jalen Ramsey who's limited opposing WR1's as of late. When these two teams met in Week 3, Davis was limited to 2-34-0. While Davis' target share has increased since then due to a season-ending injury to Delanie Walker, it's going to be tough for Davis to surpass double-digit fantasy points this week. After Cameron Brate busted last week against the Carolina Panthers, owners are left wondering what to do - he's the only TE with a quarterback that likes to target that position, right? In the 2 games without O.J. Howard, Brate has only had 3 receptions in each of those games. He's not a high-target guy and will remain reliant on a short-yardage, end zone touchdown to have a great fantasy day. With this week's matchup is against the Saints who haven't allowed a touchdown to the since Week 7 and are allowing the 2nd-fewest fantasy points on average to the position (8.0), Brate is a must-sit this week. Jason Myers is currently the 3rd ranked kicker in the league this season, however, should be sat against the Buffalo Bills this week. The Jets have the third lowest implied team total of the week with only 17.5 and the Bills defense has only allowed 5 total fantasy points to be scored from opposing team's kickers over the past two weeks combined. Choosing the right kicker to roster this week can be the difference between moving on to the semi-finals and being sent back empty-handed - chose a kicker with a higher chance of scoring this week as Myers is not the answer for Week 14. The Chicago Bears defense is currently ranked 1st in the league however they have a very difficult task ahead of them this week as they play the Los Angeles Rams who are scoring a ton of points on opposing defenses on a consistent basis. The Rams are expected to score around 4 touchdowns in this game with an implied team total of 27.75 and certainly have the upside for more. With the Rams still not in the clear for the number 1 seed in the NFC, they will be all guns blazing in this matchup which should see upwards of 53+ total points.